Any Gongfreaks reading this will by now have heard that the Divided Alien has departed for the Isle of Everywhere. 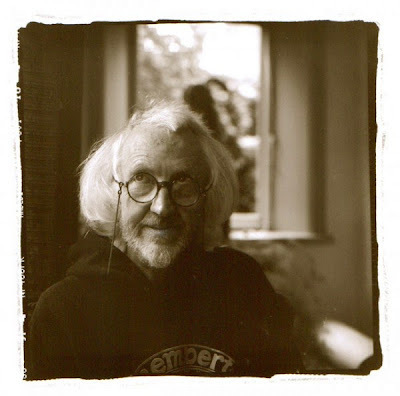 I was lucky enough to have spent a day out with Daevid in the Canterbury area in 2012, the results of which can be heard in the final installation of my Canterbury Soundwaves podcast. I also got to see him and Gilli onstage in Brighton on the final Gong tour that year (he had more energy than anyone in the audience, it seemed!) Also very grateful to have caught the Gong lineup involving Steve Hillage in the summer of 2009 (one of the best gigs ever!) and to have organised an intimate little concert in a Kentish bluebell wood for him on Beltane 2013. On the evening of the 13th when the news came through the only possible reaction was to go home, get into an appropriate frame of mind and put Camembert Electrique and the Radio Gnome Trilogy on an extended playlist, put on my headphones, and take a trip to Planet Gong. Extraordinary! As the man said, "You Can't Kill Me". As well as all the fantastic music, poetry and art, he's provided us with a model for how you can get old without losing your spirit of spontaneity, absurdity and exploration, without regard for convention or external judgment. He was riding his cosmic wave 'til the very end. I know one more info about Yahoo Customer Service Number you can visit this link. Yahoo is known for its robust customer support services from the very beginning. In modern days, it has been modernized and systematized to suit the changing needs of the yahoo users. Also, the yahoo technical experts are highly experienced and they leave no issue unsolved. Contact yahoo customer service number 1-888-508-3281. Thanks for sharing your story. I'd love to read life experiences. Thanks for sharing your experience. it is always looks interesting to read real life experiences. Here, you can dial a Gmail customer care service support number to know the way to change the password of your Gmail account. Here, experts are also going to provide you varied ways to secure your Gmail against illegal activities.